Whether the water from an electric immersion water heater is too hot or too cold, it can be easily adjusted as it is thermostatically controlled. From April 2004, new and replacement Immersion Heater Thermostats need to incorporate an overheat safety cut-out so that if the water thermostat fails, the water in the cylinder will not overheat which could cause scalding water to come out of the taps. If you have a Thermostat without a overheat safety cut-out, it is well worthwhile changing the Thermostat for a modern type even if the existing one is working. SAFETY - THIS ADJUSTMENT CAN BE CARRIED OUT WITHOUT ISOLATING THE ELECTRICITY SUPPLY TO THE IMMERSION HEATER PROVIDING THAT THE HEATER HAS BEEN SAFELY INSTALLED WITHOUT LEAVING EXPOSED MAINS WIRING - IF IN DOUBT, ISOLATE THE ELECTRICITY SUPPLY AT THE CONSUMER UNIT. 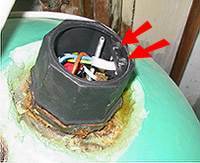 The protective cap over the connections to the immersion heater is normally held in place by a nut or screw. Using a spanner or screwdriver, remove the fixing and remove the top cover. With some models of heaters the top cover and body are one piece. Once the top cover has been removed, release the mains cable clamp (on the model shown here, the clamp is held in place by a strap with two screws). The body of the cover can now be pulled to one side. Identify the adjustment for the thermostat - note, normally the adjustment is opposite to what one expects, turning it clockwise will reduce the temperature setting. Using a small screwdriver adjust the setting as required (clockwise to reduce the temperature, anticlockwise to increase it on the illustrated example - other models may differ, so check the markings). As you rotate the screwdriver, you should hear a 'click' at the current temperature of the water. Try a small adjustment and see the affects over a few days.